Abnormal swallowing, or inability to swallow. Dysphagia can result from such diverse causes as surgery on the larynx or neck, stroke, the aging process, tumor, injury to the neck, or radiation, among other things. This therapy is typically provided by a speech-language pathologist (and, more informally and adjunctively, by other healthcare professionals). General areas of teaching might include: choosing wisely which food types and consistencies to eat; swallowing maneuvers such as tucking the chin, double swallow, effortful swallow, head turning, and supraglottic swallow; and direct exercises for the tongue, pharynx, palate, and larynx. These are suggested dietary changes, particularly regarding food consistencies, directed at improving a patient’s ability to swallow and at avoiding aspiration. For example, an individual who is struggling with aspiration might be advised to avoid thin liquids and use thicker or carbonated liquids instead. Or this individual might be advised to avoid composite foods, since his or her swallowing deficiency could make it harder to “stay organized” with several consistencies in the mouth at once. 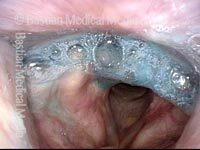 Panoramic view of laryngopharynx before administering blue-stained applesauce. Same view after first bolus of blue-stained applesauce. The vallecula fills with material before the swallow “happens”—signifying a delayed swallow reflex. 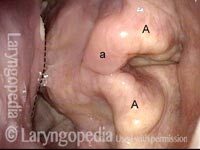 After several rapidly-administered boluses (to assess patient’s “limits”), note hypopharyngeal pooling, but none within the laryngeal vestibule. Shows trace of blue-stained applesauce remaining behind after the patient has swallowed. 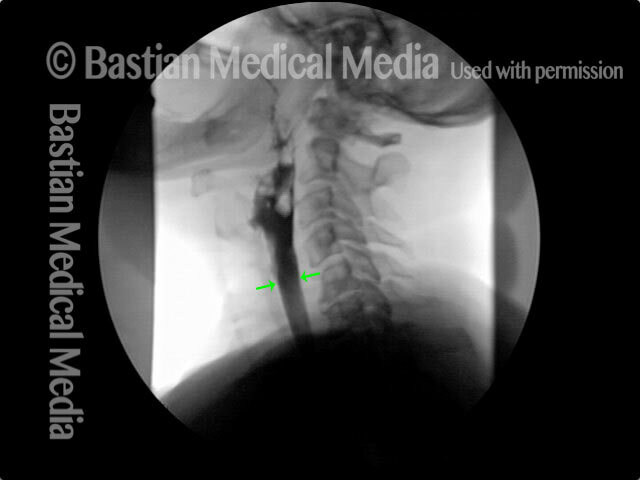 Lateral x-ray of the neck while swallowing barium (seen as a dark column). The non-relaxing cricopharyngeus muscle (light-grey bulge outlined by a dotted line) is causing narrowing of the upper esophageal passageway, as highlighted by the narrowed stream of dark barium at that point (arrow). Liquids and very soft foods can squeak through this narrow opening, but solid foods tend to get stuck. After myotomy. The surgically divided muscle can no longer narrow the upper esophageal passageway, as seen by the widened stream of dark barium at the level of the muscle (arrows). 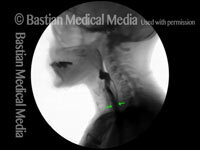 Lateral x-ray of the neck while swallowing barium (the dark material seen here in the throat). The non-relaxing cricopharyngeus muscle (light-grey bulge outlined by a dotted line) is causing narrowing of the upper esophageal passageway, as highlighted by the narrowed stream of dark barium at that point (arrow). Liquids and very soft foods can squeak through this narrow opening, but solid foods tend to get stuck. Left tongue paralysis and atrophy (the left side is right of image), due to injury of the left hypoglossal nerve during neck surgery elsewhere. The tongue and its midline raphe (arrows) deviate to the atrophied side. This atrophied side of the tongue cannot “do its part” in the propulsive stage of swallowing. Hypopharyngeal pooling of saliva in the “swallowing crescent.” This pooling can suggest non-relaxation of the cricopharyngeus muscle as an additional swallowing impediment, though in this case a videofluoroscopic swallowing study does not confirm this hypothesis. After administration of blue-stained applesauce, the same hypopharyngeal pooling is seen, now of now-blue-stained saliva. 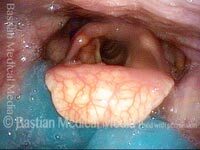 This closer view within the larynx shows not only soiling of the laryngeal vestibule with saliva bubbles, but also a left contact granuloma (right of image). 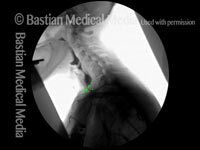 This injury could be the result of intubation four months earlier, or else of the continual coughing and throat clearing that occurs with this patient's swallowing disorder. A young woman struggles to swallow after extensive cauterization of severe bleeding after tonsillectomy elsewhere. The arrows here show the path food and liquid should follow to get into the esophagus (opening indicated by flat oval). 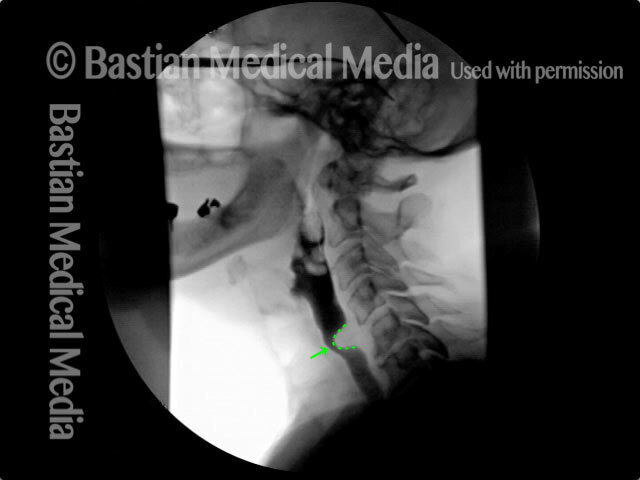 Closer view shows that the epiglottis is tethered to base of tongue at the dotted line. 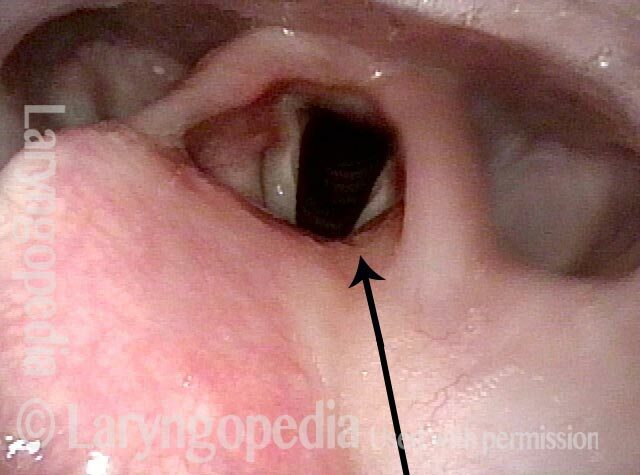 Furthermore, the "ski jump" scar appears to be ready to divert swallowed material directly into the larynx (arrow) rather than into the pyriform sinus at *. 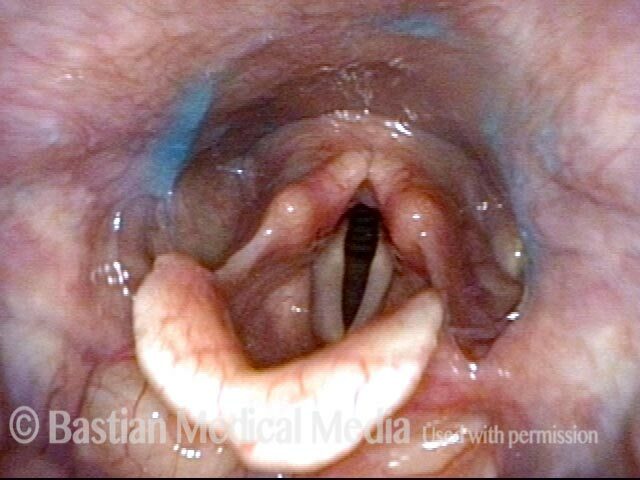 A closer view shows even better the "chute" into the larynx. While swallowing blue-colored water, arrows indicate the normal path on the left (right of photo) and the abnormal diversion into the larynx on the right (left of photo). The patient manages, but must swallow carefully, especially since the epiglottis cannot invert since it is scarred to the base of tongue as shown in photo 2. This elderly man is having a hard time swallowing solids. There is a mucosa-covered mass (marked with lines) between the posterior pharyngeal wall (longer dashed line) and the arytenoid towers (marked with A). "V" denotes the right vocal cord. At much closer range while having the patient perform a trumpet maneuver. This is a week after laser excision of this mass. The dashed line again shows the posterior pharyngeal wall and A and V again denote arytenoid apices and V, the right vocal cord. The pathology examination shows only fibrosis and other nonspecific benign findings. Now performing trumpet maneuver (as in photo 2), the upper edge of the excision is shown (dashed line, left of photo). In spite of a very sore throat, this man can already sense improvement in his swallowing. This video gives an overview of how swallowing works, how it can sometimes go wrong (presbyphagia or cricopharyngeal dysfunction), and possible ways to treat those problems (swallowing therapy or cricopharyngeal myotomy). This entry was posted in Multimedia Encyclopedia and tagged Disorders, Photos, Swallowing disorders, Videos by admin. Bookmark the permalink.